06:15 For whom the bell tolls..time to get up, try to awaken and get some nourishment into the system. Reads Cut of womens clothing and Patterns of Fashion 1 during breakfast. 10:19 Time to start working on the Steam punk coat since my official work hours has started. Pins the assembled pieces to Vermont. Don't like the skirt, at all. Too much red.Rips it off. Pins some "bows" made of scraps on underskirt. Ahhh, much better! And all I have to do skirt wise now is to make proper bows! 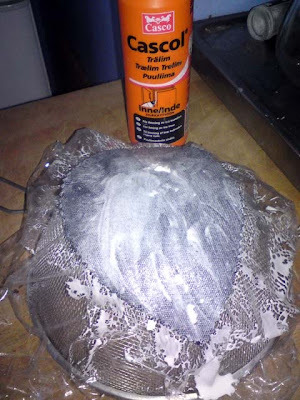 While the food gets warm in the oven I start to stiffen a fascinator base with glue. I plan to have BIG hair on Saturday and then my all black hat will disappear in the blackness of my hair. So a fascinator it will be. 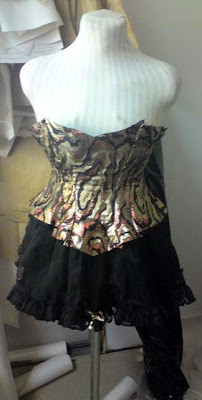 I will cover the base with the same fabric as the corset and edge it with black bias just as the corset. I'm not sure what to embellish it with yet, I will take a hike to the big craft store in Sthlm on friday and see what they can offer. A black feather and some gold net would be nifty. During food warming I also manage to stitch one more panel to the corset and cut some ribbons of the fashion fabric with my pinking scissors. 17:19 After 4+ hours of fiddling with the lining of the steampunk coat, I had enough. I don't do modern lined clothing very often so I tend to forget how to do it between the times :/ I find it erasier to make a corset than to make a modern lined garment....So I will continue with the lining tomorrow and I continued to assembly the corset instead. 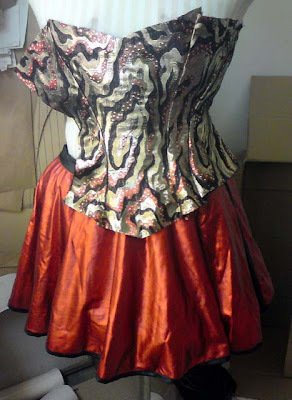 19:07 Corset is ready for boning! Yay! I will try to put in all the spring steel tomorrow and cut the crinoline steel. I need to buy tipping fluid when I go to town tomorowr afternoon. I also need to buy 4 m of black satin bias binding and find some hat decorations. I don't have high hopes for the latter, Uppsala is not a good town for costumers, but you newer know... Here is a picture of the unboned corset on vermont. 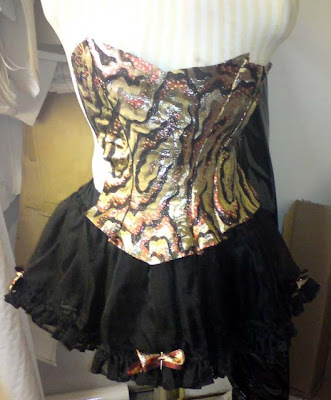 I have also pinned some bows and bells to the skirt. I'm not sure about the bells. I kind of think they look cute but maybe they just look silly? If i keep them (one at each quarter) I will also add one with a bow at the neckline CF on the corset. Now I'll snuggle in the couch with a warm wool blanket, a big cup of yogi tea and work on my striped petticoat while looking at The Duchess. I'm in awe over your speed! LOL, I'm working on a faschinator too- and I'm thinking black feather and silver net. But I have a round shape and have covered it with black velvet.